I love to show children my love of reading, so when my young dancers need a rest, I often pull out a book for a quick story time. Sometimes the transition back to dancing can be a rough one if the kids are particularly drained…but not with this book! It is a great introduction to isolating parts of the body…a necessity for dancers! The book moves kids from the floor back to standing up seamlessly! It has beautiful watercolor collages! From Head to Toe starts with movements we can all do sitting down—”I am a penguin and I turn my head. Can you do it? I can do it!”—and leads us to all 4’s vigorously kicking up our “back feet” like a donkey! 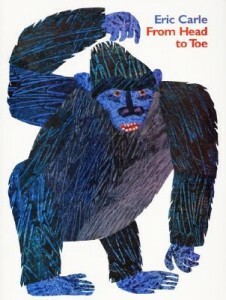 Read more ideas for how to use From Head to Toe in a preschool or grade school classroom here on Eric Carle’s website.